According to NASDQ Stock Market, the American stock exchange, the term means one thing. They even use the term Guru Analyst fares their decisions based on the theories of Peter Lynch , Benjamin Graham and other stock-picking legends, based on Validea's interpretation . 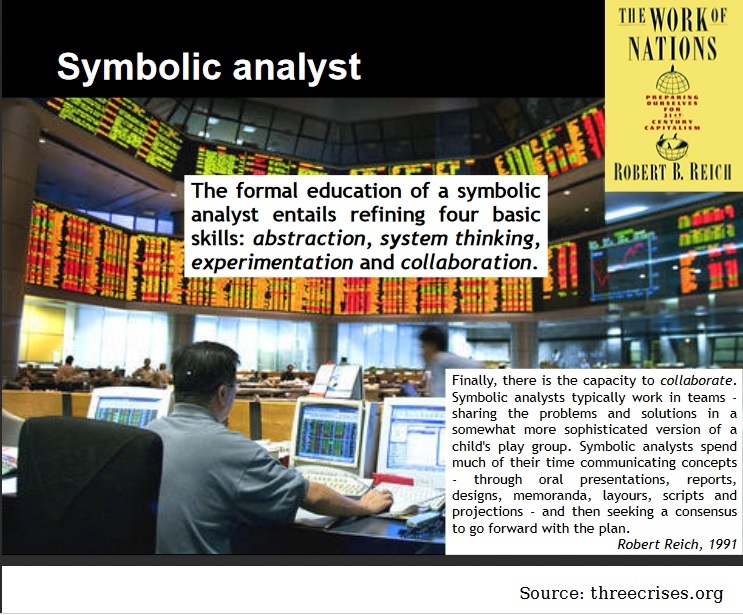 ... and his book "The Work of Nations "
What is a Symbol Analyst doing on a daily basis? Reich is an American political man, professor, and author. He wrote the Works of the Nations in 1992. He served in the administrations of Presidents Gerald Ford and Jimmy Carter and was Secretary of Labor under President Bill Clinton from 1993 to 1997. How do you plan to earn your living? Some skills will be in demand, while others will disappear! The essay Robert Reich wrote, perceived as a political economist, changed my way of thinking about job security. He thougt and coined this term (Symbol Analyst) back in 1992 one year before he was appointed Secretary of Labor under President Bill Clinton from 1993 to 1997. Listen (and watch) to this interview (1992) where he speaks about his ideas on the future of work. Some of my thoughts are borrowed from this web blog (no guarantee the site is still up and running). an innovator who can visualize new uses of existing technologies. My take on this, when Reich wrote his thoughts on the global economy subject (remember, we're in the nineties and, per example, Bell Northen Telecom was a Canadian Jewel then), he inspired many people and his thoughts on the future are standing strong. What I may add after reading his book is that the concept of Symbolic Analyst applies to lower levels of workers. No need to have three university diplomas to identify yourself as a symbolic analysty. The same principle and thought on this emerging job title applies to kids, nerds, hackers, drop outs on might say. The symbolic analyst, however, contains a commodity that is both valuable and irreplaceable. This is the human thinking and problem solving abilities that is becoming ever more important in international business. Specialized groups of problem identifiers and solvers sprout all over the globe, selling their services to a wide variety of customers. This growth might not seem beneficial for the industrial world at the moment, in the traditional sense, as analysts will work for foreign companies just as easily as local businesses ones. But the intangible gains of knowledge and experience stay within our country. Please, read at least three of these books, they're all great and full of wisdom. In closing, I'm inviting you to think about the here and now. Jobs may be difficult to find if your looking for a 9 to 5 job in the six figure salary range, locally. Yet, if you adapt and use your creativity, wealth and security will be yours without a doubt. Hooray for this new job title. Hooray for Symbol Analysts. Pour obtenir quelque chose qu'on a jamais eu il faut être prêt à faire qq chose qu'on a jamais fait. TéléPartout ne partage pas votre adresse email, vous avez notre promesse, c'est garanti.